Cheektowaga leapfrogged Maryvale for second place in ECIC Division III after downing last year’s division champs, 57-48. The Warriors are now just a game back of division leader Iroquois. The Chiefs did not play Friday night. 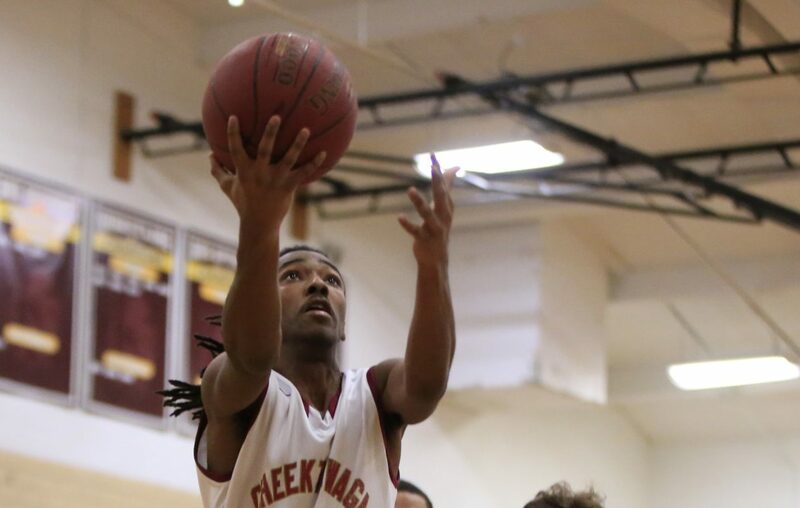 Driving the Cheektowaga offense was senior Armondez Cleague, who racked up 21 points and pulled down 14 rebounds. “When he’s playing within himself, he can make some special plays,” said coach Pat Cullinan. Cleague has averaged 13 points per game this season, good for seventh in the division. Fellow senior Derek Frank added 16 points for Cheektowaga. The win sets up a crucial showdown with Iroquois on Tuesday with a tie for control of the division on the line. Another masterful performance from Noah Hutchins combined with a strong defensive effort lifted Park over Lew-Port, 84-68, on Friday. Hutchins, a McDonald’s All-American team nominee, logged 22 points and 11 rebounds in the win for the Monsignor Martin league-leading Pioneers. Park coach Rich Jacob couldn’t say enough about the 6-foot-1 point guard. Keonjay Carter and Ebuka Quentin Nnagbo recorded 17 points apiece as well for Park. Jacob said he mixed up his defense “two to three times” to exploit different matchups and keep the Lancers’ offense in check. Jalen Duff was able to do damage from the outside by hitting six 3-pointers. He led Lew-Port with 18 points. Another WNY basketball player reached the coveted 1000 point mark Friday. Ellicottville senior Linnea Jimerson reached 1000 by scoring 23 points in a 75-36 loss to Franklinville. Jimerson, who will play basketball at Jamestown Community College next year according to coach Chelsea Cole, only needed three points to reach the goal. She got them on two layups. A four-year starter on the varsity team, Jimmerson also logged 14 rebounds against Franklinville for a double-double performance. She averages about 16 points per game. The Olean, Falconer and Niagara Wheatfield wrestling teams will compete in the second New York State Public High School Athletic Association Dual Meet Championships on Saturday at the DRC Arena and Events Center in Syracuse. With the Section VI Dual Meet Championships canceled by the weather last weekend, Olean and Falconer were awarded automatic berths and Niagara Wheatfield was selected as a wild card. Seeding for the tournament was done on a points-based system that rewarded teams for having wrestlers who placed in the state qualifying tournament and state tournament last season and also for having wrestlers who are enjoying stellar seasons. Niagara Wheatfield is the No. 2 overall seed. There are 12 teams in Division 1 and 12 in Division 2 with matches beginning at 9 a.m. with the semifinals at 3 and the finals at 6. In Division 1 pool competition, Olean will face Spencerport from Section V and Fulton from Section III and Niagara Wheatfield will face Chenango Forks from Section IV and Fox Lane from Section I. In Division 2 pool action, Falconer faces Warrensburg from Section II and Saranac from Section VII. Upon further review, Frontier/Lake Shore/Orchard Park’s Brooke Becker isn’t the first Federation girls hockey defenseman to record 100 career points. Class of 2013 Mount St. Mary graduate Julia Duquette of the Monsignor Martin team was the first defenseman to reach the milestone, finishing with 103.